In recent years, even I have had to acknowledge that I have entered, albeit reluctantly, the category of the mature airman. As such, I have joined the ranks of those with a successful (read survived) flying history spanning fifty years or so and it is natural for the august members who inhabit this strata to be occasionally asked by our younger brethren about things that they consider worrisome in their own flying career. Crashing would be one. How many times, they will ask, I have been involved in occasions where the retail worth of the airplane I was flying was rapidly and substantially reduced? It's a complicated question to answer, especially if you take the Clinton-esk approach to it and say it depends on what your definition of crashing is. I choose to do that, since it reduces my record of shame by fifty percent if I don't count flying the Super Cruiser through the top of a large Oak tree as a crash. My point there being that the airplane did not come to a complete stop, which I maintain is a basic requirement for a certifiable airplane crash. Strangely enough, at the time of this happening I had every intention of crashing the airplane and it was a failed attempt. Circumstances, which I won't recount here, had given me a choice of either crashing into the top of the tree or the trunk of the tree and since the top looked so much softer I had chosen it. Imagine my delight when the rugged little Piper came out the other side of the tree, still flying but looking considerably more ragged that it did when it entered the canopy. So with the Super Cruiser caper eliminated as major blot on my career I'll move along to the one time I really did the deed. 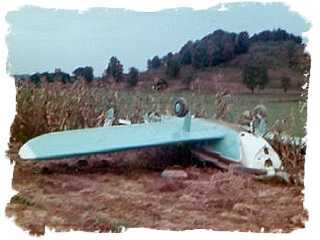 In the summer of 1968 I was running a little flight school on a sixteen hundred foot sod strip at the bucolic little town of Buckhannon, in Central West Virginia. We were using a Citabria, a Champ and a J-3 for instruction and with our low overhead we could offer rates that had students driving by the bigger airports with their new Piper's and Cessna's to come and fly with us. One of the many aspiring aviators that came to us to learn to fly was named Joe-Joe, and therein hangs the tale of how I managed to crash one of the safest and easiest to fly aircraft ever designed. I'm not sure why Joe-Joe wore the double name, but I think it had something to do with his being descended from the large Italian community that had formed around Clarksburg in the early part of the century, when immigrants had come to work in the mines and the factories. He was short, personable and a snappy dresser, complete with the gold chain around his neck. He worked as a salesman for a large pharmaceutical company and his desire to be a flyer was almost palpable. Apparently this was something he had thought about for a long time and after his first lesson he jumped in with unbounded enthusiasm and bought every pilot related accessory he could find, including a license plate for the front of his car that identified him as a pilot. I remember Joe-Joe as an average student, neither slow nor quick to pick up the nuances of flying an airplane, but always very enthusiastic about learning and just completely in love with the whole package of aviation. He always showed up on time for his lessons and spent hours just hanging around the airport, talking with the other students and being part of the airport scene. Often times he cheerfully volunteered to help out with the endless and thankless chores that always needed to be done around the field, such as washing airplanes and sweeping out the hangar. It didn't surprise me then, shortly after I had soloed him in the Champ that he came to me and wanted me to help him buy an airplane. He had his eye on an Ercoupe that was owned by an old gentleman who was retiring from flying and had mentioned around the Clarksburg airport that he wanted to sell it. I went there with Joe-Joe a few days later, looked at the airplane and gave it my blessing. A few days after that he called me and said he had bought it and asked me to come to Clarksburg and check him out in it. I did, and after three or four hours he was comfortable flying it from the 4200 by 100 foot runway there where he had rented a hangar and where it would be convenient for him to get to the airplane. I went on back to the flight school and for a few weeks I didn't hear from Joe-Joe. He called one day to say he had been flying the Coupe and getting along well, but he'd like to be able to bring it into our little strip and visit with his buddies here. I agreed to fly in with him and get him checked out and comfortable landing the airplane on a short, grass strip. I had a break in the schedule on Sunday afternoon and I agreed to travel to Clarksburg and fly with him. I had a solo student drop me off there and Joe-Joe was waiting for me with the Ercoupe, standing proudly in front of the airplane by the terminal restaurant, the airplane shiny and well kept in the September sun. I started the lesson by having Joe-Joe do slow flight and we worked on maintaining speed by attitude and altitude by throttle. He seemed at home with the concept and after an hour or so of this drill we headed south for our airport. It was a hot, early fall day and the wind was a gusty crosswind when we turned final for what would be runway 26 if we could have painted numbers on the grass. Joe-Joe was flying the airplane well as we approached the runway, sliding down the air over Doctor Goulds's potato field next to the airport, holding the speed at 65 miles an hour with the attitude of the airplane and keeping just enough power on to carry us to our intended landing spot about a hundred feet beyond the fence that bounded the airport. The closer we came to the ground the more unstable the air felt and I could see the windsock switching back and forth in the distance. When we were about 200 feet from the boundary fence and 50 feet above the ground the airplane encountered a strong downdraft and suddenly started to lose altitude. Before I could react, Joe-Joe quickly pulled back on the yoke. I've read that Ercoupes are designed not to stall, but I'm here to tell you that they are champion mushers. The airplane dropped out from under our butts as I slammed the throttle forward, but it was too late. We hit the plowed ground of the potato patch with a bone jarring impact, bounced once and with the second impact the nose gear dug in and the airplane started to go over. In my mind's eye I can see the still rotating propeller slow and start to bend backward as the airplane turned a slow summersault. We slammed into the earth upside down and the canopy shattered and crushed down until we were hanging suspended upside down inside a dark compartment, quiet except for the ticking of the cooling engine. The master switch was still on and since my first impulse was to release my belt and lower myself to where the canopy had been and which was now the rich brown soil of the potato patch, I became completely disoriented and couldn't locate the switch in the darkness. Fire was foremost on my mind and I imagined that I could smell smoke and suddenly I became a one man tunneling machine. I started digging down in the soft ground until I got beyond the airplane, turned left and popped my head out in the daylight beside the fuselage. A quick look proved there was no smoke and therefore no fire and my panic calmed. I called the good news in to Joe-Joe and he followed my escape route out of the ruined airplane and we stood in the sunlight and surveyed the mess that had been a beautiful airplane moments before. In the years since, I've thought a great deal about what happened that day and I think the painful lesson served me well in the many hours of instructing and of demonstration flying that were to follow. Skill is achieved in flying, as in many other things, not by always doing things perfectly, but by making mistakes and learning how to avoid them. In flying however, there is a narrow window of error to safely allow the student to learn. My mistake as a low time instructor was letting my student get himself into a situation that I couldn't get him out of. Joe-Joe got the Ercoupe repaired and owned it for the next twenty years or so. I felt terribly guilty for letting him smash his ship, and for as long as I operated an aircraft repair shop I provided free maintenance for the airplane as well as having our paint shop apply new livery once the repairs were completed. Joe-Joe continued to fly, but I think the experience scarred him and he was never a confident pilot after that. This of course, made me feel even worse as his hours logged became less and less each year. Toward the end of his ownership of the Coupe he wasn't leaving the ground without another pilot in the airplane. He would however, make his way solo over to the ramp in front of the airport restaurant on Sundays when diners filled the place. There he would do twenty minute runups with the canopy sides slid down and the long white scarf he wore whipping back along the side of the airplane in the prop wash. This was a romantic and nostalgic sight for the older aviators looking out from the restaurant, and of course the girls dining there liked it too.